Jeff For Banks: Why SunTrust and BB&T? Why? 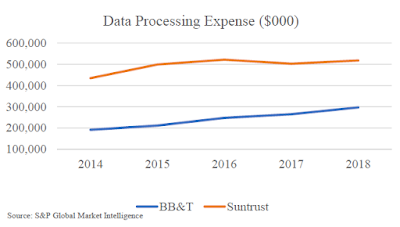 Why SunTrust and BB&T? Why? I know on the investor conference call, Kelly King of BB&T and Bill Rogers of SunTrust spoke to why. But I may not have been listening well. I suppose much of the discussion revolved around scale. So, along with my first inclination, my second inclination was also... why? 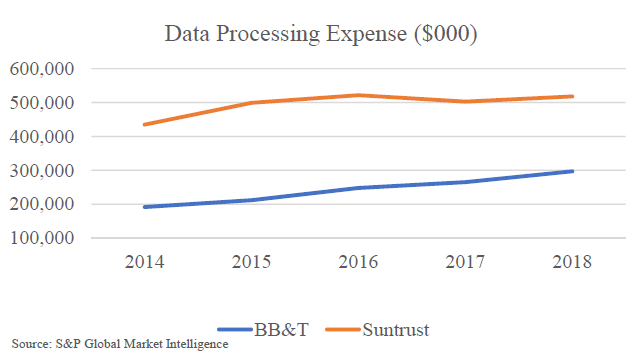 BBT (bank only) had $6.3B in operating expenses in 2018, five percent of which is in the Call Report category "Data Processing Expense", defined as expenses paid for data processing and equipment such as telephones and modems. It does not include employees. STI (bank only) had $5.4B, 10% of which was in Data Processing Expense. I find it difficult to believe they can't find enough money in that pot or outside of the Data Processing pot for technology innovation. It would be a travesty of management. Perhaps they would find it difficult to maintain that level of EPS growth, given the law of large numbers. But they chose to solve that problem by becoming larger? BB&T will issue 1.295 shares for each SunTrust share outstanding, increasing their share count from 777 million to 1.4 billion. So to earn one cent per share more, the combined company would have to generate $14 million in additional net income. And at the 1.5% ROA BB&T already achieves, they would have to grow $933 million for each penny of EPS growth. To maintain 10% EPS growth, the combined bank would have to grow about $39 billion per year (42 cents x $933MM). Perhaps they felt the pressure "to do something", as my BB&T regional business banker friend told me, saying that at their size they were in "no man's land". I don't know what that means. But an investment banker told me today that investors are intolerant of tangible book value per share dilution of more than three years. So if you feel you need to "do something", and can't overly dilute your book value, perhaps a merger of equals (MOE) makes sense. I have preached MOE virtues for banks that could actually benefit from scale to achieve better efficiency ratios. Statistically, banks between $5B and $10B in total assets are better at it than larger financial institutions. But I digress. I have written in the past about financial institutions running into the law of large numbers, leaving only acquisition as its means to meet shareholder expectations. I'm not saying it's impossible, as JPMorgan Chase did it ($2.6T in total assets, 14% EPS CAGR since 2014). But it's difficult. And JPM received a huge boost from tax cuts. 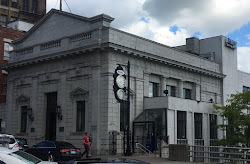 Financial institutions, in my experience, are not keen on turning themselves into cash cows, maximizing their profitability with slower growth and paying a higher proportion of shareholder returns in dividends. Financial institutions also don't tend to buy and divest lines of business as a means to stoke shareholder returns, as very large industrial firms do (i.e. GE). Want to be notified via e-mail when new posts are up? Follow by e-mail in the upper right column! I haven't spammed anyone yet! This article relates to my firm's Financial Advisory services. Click on the link to learn more.